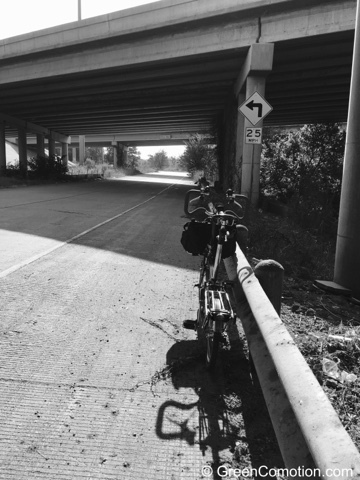 Part of my bicycle commute takes me under a desolate part of a street under Texas Highway 121. I usuaully stop here to catch some shade. Yesterday, it did get up there in temperature, so the shade was very welcome. Why not a snap too, eh? Anytime is a good time for taking a photo! That's why we carry cameras everywhere, right? It was worth stopping, and you got a nice photo. 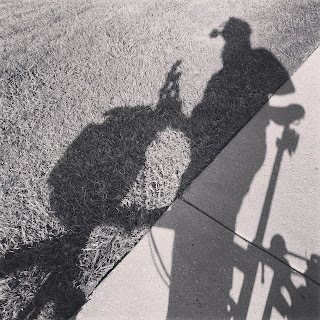 Can your bike outrace its own shadow? Thanks for joining the fun at Shadow Shot Sunday! I see a window into the light. at least you have some shade. be careful in the heat. Bikes make the best shadows. I bet that shade was welcome! !